Queer Threads: Crafting Identity & Community presents twenty-four artists from around the world who mix fine art traditions with thread-based craft materials and processes-from crochet, embroidery, knitting, and lace to macramé, needlepoint, quilting, and sewing-to remix contemporary gay & lesbian culture. “Queer Threads” will fully activate the Museum’s gallery through felt paintings, yarn drawings, embroidered portraits, knit sculpture, quilted tapestries, and crocheted installations, as well as video. Wikipedia about the artist: “Maria E. Piñeres is a Colombia-born American artist who lives and works in Los Angeles, CA. She is represented by DCKT Contemporary in New York City and Walter Maciel Gallery in Los Angeles where she will have her sixth solo exhibition in early 2011. 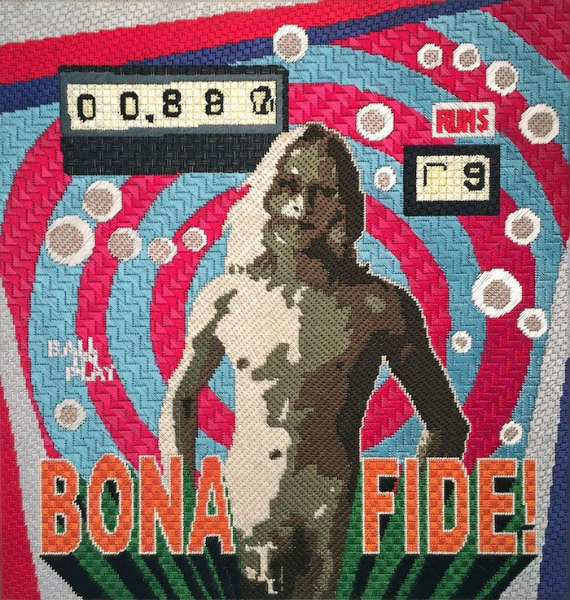 Her work, mostly embroidery, has been exhibited at the Museum of Art & Design in New York City.